The living room is starting to look less like a construction site. The rug is Sakura from West Elm. Window coverings as vexing me more than I should let them. More on that later. Do we like? The white fireplace looks alright, ya? I think it looks great! 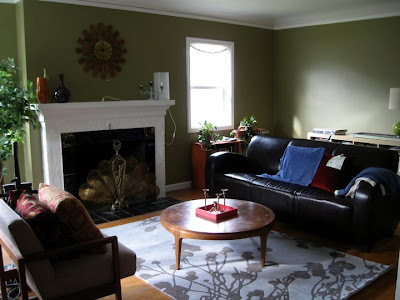 I love that green, and the white fireplace really stands out nicely against it!